At any time, there are millions of bacteria, germs, and viruses around us which could potentially cause harm. Thankfully, the body has a natural immune system made up of specific and non-specific functions (such as acidic juice and skin) which work together to prevent these potentially deadly microbes from causing any harm, forming immunity against such microbes and pathogens. 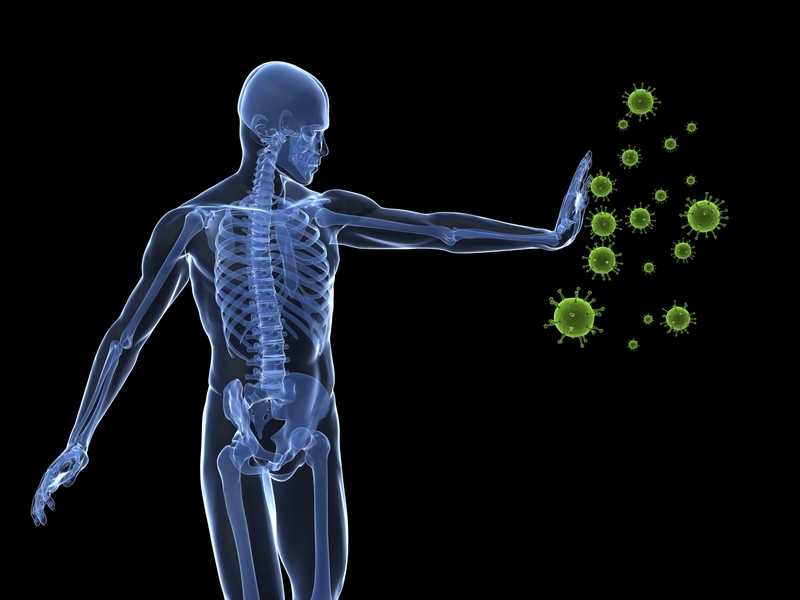 The immune system function in detail is exactly what to be talked in this article. The lymph nodes are included within the lymphatic system which also includes the spleen, bone marrow, and the thymus. Lymph nodes are small and bean-shaped, and their main function is to produce and store disease-fighting white blood cells. They also contain a clear liquid known as lymph, which carries the disease-fighting cells around the body. It is possible for one's lymph nodes to become sore and swollen when one's body is fighting against disease of infection. The spleen is the largest organ within the lymphatic system. It can be found on one's left side, above the stomach and under the ribs. The spleen contains white blood cells that work to fight and eradicate disease and infection, when needed. The spleen is also though to help regulate the volume of blood within one's body, as well as remove old and/or damaged blood cells. Bone marrow is yellowish, spongy tissue that is present within some bones (such as the femur). Bone marrow produces white blood cells and stem cells. Stem cells, especially the embryonic variety, are revered for their adaptability, the ability to transform into any cells within the human body. The thymus is a small organ resembling the shame of a thyme leaf. Often overlooked when speaking of immune system function, this organ (which resides beneath the breastbone) is where T-cells mature. This kind of cells is crucial to adaptive immune system. Thymus is large in babies and active before adolescent. Late, it will shrink and be replaced by fat. There are many cells which work collectively as part of the immune system to fight against disease and infection. The table below lists the important cells that work to do this. There are two main types of T-cells. The T helper subset (or CD4+ T cell) works as an immune system regulator, which works to stimulate the activation of cells to fight and kill infections. The other main type of T-cell is the T suppressor subset (or CD8+ T cell), which works to directly attack and kill certain types of viral-infected cells, tumor cells, and occasionally parasites. B-cells, or B lymphocytes, lay a vital role in that they produce antibodies which respond to invading proteins of viruses, bacteria, and tumor cells. These specialized proteins, known as antibodies, bind to the intruding and unwanted proteins, which signals other cells to attack and destroy the pathogenic protein cells. Natural killer cells are similar to CD8+ T cells in that they attack specific types of tumors, such as lymphomas and melanomas. These cells can work independently to eradicate certain tumors, but are more effective when instigated by CD4+ T cells. Polymorphonuclear leukocytes are a group of white blood cells composed of three types: neutrophils, eosinophils, and basophils. These cells are of paramount importance in immune system function in that they work against parasites and bacteria from one's body by engulfing the pathogens and breaking them down using potent enzymes. Macrophages can detect foreign and unwanted materials (such a pathogen) which have entered the body, and report them to B and T cells for eradication. Also known as antigen-presenting cells, macrophages essentially initialize the response of the immune system to unwanted foreign substances. Much like macrophages, dendritic cells also act as antigen-presenting cells. Originating from bone marrow, dendritic cells can be found in all over the body within the blood stream, body tissue, as well as the organs of the lymphatic system. They work to detect and apprehend antigens and carry them to the lymphatic organs, where the immune system can initiate the eradication process. How Does the Immune System Function Work? As mentioned, there are numerous organs and cells that make up the human immune system, giving us immunity from numerous infections and diseases. So how do they cooperate to complete this function? The immune system must first identify a foreign antigen when it invadesin our body. To do this, antigen-presenting cells (such as dendritic cells and macrophages) must be present to detect the antigens. Once the antigen is detected, the antigen-presenting cells present the antigen to either T or B cells. If the B cell is initiated, it works to create antibodies which bind to the foreign antigen to eradicate them. These antibodies may also trigger the activation of natural killer cells, which help to kill the antigens. If the antigen is presented to the T cells, then one of two things can happen. If it is CD4+ T cells that the antigen is presented to, the T-cells will increase and become secretory. If it is CD8+ T cells that the antigen is presented to, the T cells will become active and begin to attack and kill the pathogenic cells they have been presented. Working together, the organs and cells that work to ensure proper immune system function ensure that we are not harmed by the vast amount of bacteria, germs, and viruses we are exposed to on a daily basis. Here is detailed video, telling you vividly that what immune system function works when bacteria has infected your body.